Anything that interests me as an author and a reader - and anything else I feel strongly about! I am also interested in the German market for translated work. Today the first of a number of planned 'Teasers' was launched - others will follow. Please Click Here if you would like to see it. An important part of translation is not only to change the language but to maintain the mood and keep the integrity of the story. Most of all, it must be readable in the new language. When my book 'Clan' was translated into German I was lucky to have a great translator who I needed to trust and rely on with my baby! The following is just a bit of fun - but makes the point. I took the first few lines of the book (detailed below) and used Google Translate to translate them into German. I then copied the German and pasted it back into Google Translate and asked it to translate the German back into English. Quite Interesting as Stephen Fry might say. "It was half scream and half roar. Seconds earlier, the Great Hall, with its blazing wooden wall torches and man-high open log fires, was echoing with the clamour of dozens of warriors, some lounging at long trestle tables picking at huge platters of cooked meats consisting of whole roasted suckling pigs and poultry and massive sides of beef, as well as piles of coarse bread, fruits and large jugs of rough wine and ale." "Es war halb und halb Schrei brüllen . Sekunden zuvor hatte der Great Hall, mit seinem lodernden Holzwand Fackeln und mannshohe offene Kamine , wurde mit dem Lärm von Dutzenden von Krieger Echo , einige Faulenzen am langen Holztischen Kommissionierung auf riesigen Platten mit Wurst , bestehend aus ganzen gerösteten Spanferkel und Geflügel und massive Rinderhälften , sowie Haufen von groben Brot, Obst und große Krüge mit Wein und Bier rau ." "It was half and half roar scream. Seconds earlier, the Great Hall , with its blazing wood wall torches and head-high chimneys, was , with the noise of dozens of warriors echo , some lounging on the long wooden tables picking on huge plates with sausage, made from whole roasted suckling pig and poultry and massive cattle halves and piles of coarse bread , fruit and large jugs of wine and beer rough." A great opportunity to talk to authors, illustrators and film makers about books! ...and it's tomorrow!! There has been debate for years as to the correct pricing of books and I'm not sure it has ever got very far with the ongoing battle between Amazon & Hatchette as a prime example. As an author, I believe if I put some effort into writing a book, (and I do - believe me - even if it might not look like it!) 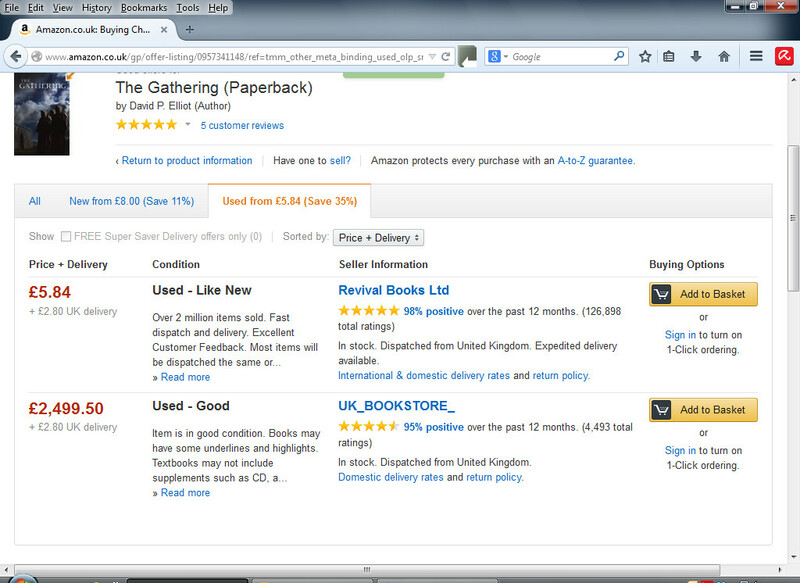 I think I am entitled to a reasonable return on that effort, whether that book be a traditional paperback or an e-book. Ultimately, however, things are only worth what someone is prepared to pay for it I suppose, but personally I would rather that decision is made by an actual reader than someone who clearly has no particular interest in books at all and in this latter category I would include the likes of Amazon and many of their so called 'Amazon Marketplace' sellers. Having found 5 apparently different sellers selling a second-hand version of one of my paperbacks for £0.01 I wondered what was in this for Amazon and or the 'seller'. I couldn't see what might be in it for Amazon - other than being right in the middle of yet another Internet transaction regardless of value, and clearly the reseller it seems to me must be expecting to make a profit on the £2.80 postage & packing charge. However, when I extended my research to another of my books, I found this second-hand listing. Things are now clearer - the true value of my books are somewhere between one penny and £2,500 each. A great opportunity to talk to authors, illustrators and film makers about books! When someone describes your book in such terms it is very difficult to be very British about it and to keep it to yourself so I apologise in advance for the lack of modesty! 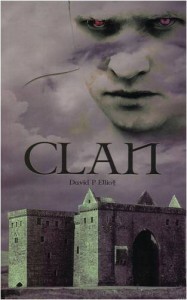 "Hi David,Well,there isn't enough words to describe the most intriguing,mysterious,wonderful book that I have ever read in my nearly 70 years.I just couldn't put it down until finished,and my dragon, [Phil] is ordering The Gathering.Every Clan member ought to read it, it would make them even more proud of being a clan member that they are now.There was one page that made me go cold, and relevant to me.Back in 1971, I was shot in the hip in an accident, and still have the bullet.See page 132.I think that Wee Jock was actually stabbed, but could i be a reincarnation? Will get in touch later as I intend to try and get to see you in Wantage. I don't think that we have met in the past. 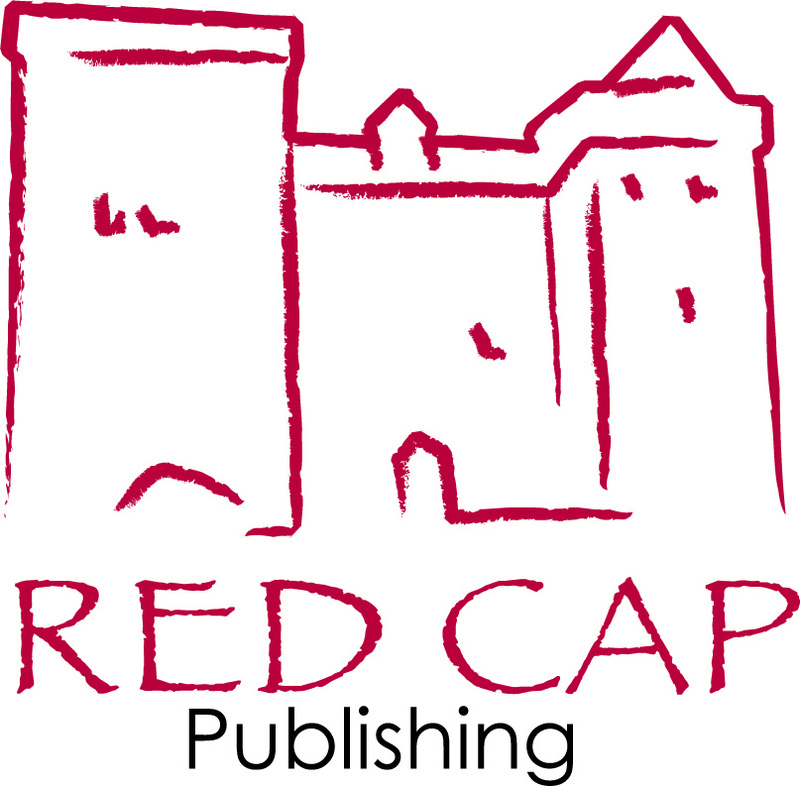 Wee Jock Elliott[with two t's]"
Red Cap Publishing are holding an open day at The Mix, Mill Street, Wantage between 10.00 am and 9.00 pm. Drop in to see Independent authors, hear about writing, publishing even turning movies into films! Drop in any time! Here's a taster... and here it is as a Facebook event. "He just keeps getting better!" 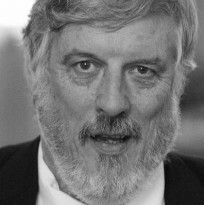 I was lucky enough to meet this author at the time he was publishing his first book 'Under the Tree' in 2013 and although it was primarily a children's book, not my usual genre! - I am always drawn to read a book when I have met the author. I'm glad I did. As a previously unpublished author I was sceptical of his plans to write a further 9 books in a series he calls 'The Northland Tales' as experience suggests that most would-be authors do not even ever finish one! I shouldn't have doubted him because earlier this year the second in the series 'The Fairey Flag' hit the shelves. Much longer, darker and more suitable for adults as well as children I found it hugely engaging and Michael T. Ashgillian was honing his craft. 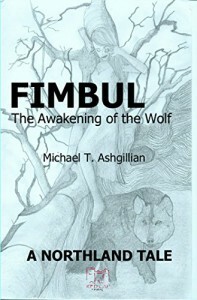 Now I have just finished the third in the series 'Fimbul: The Awakening of the Wolf' which takes the story on further and once again the writing gets better, not that it was too shabby in the first place! I no longer doubt that Ashgillian will go on to complete another 7 books (I understand the 4th is close to completion) - and I, for one, will be waiting to follow the developing stories from 'The Northland Tales' as they arrive. Highly recommended. This short (46 pages) book is beautifully illustrated and very funny fitting in very well with my sense of humour! 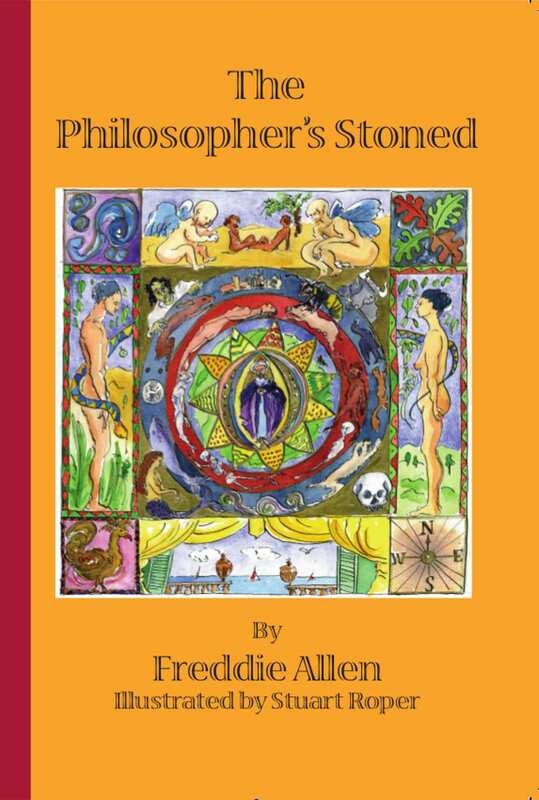 A great coffee table book to dip into or as a gift (especially with Father's Day & Christmas coming up.) Highly recommended. 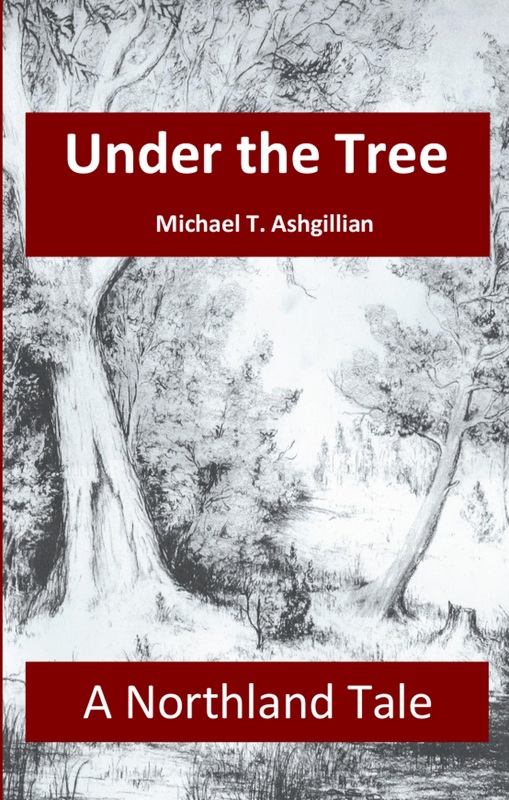 If you don't have time to read as much as you would like click here and download the brilliant audio book version of Michael T. Ashgillian's book 'Under the Tree' once you've heard it you'll want to buy the darker second of his 'Northland Tales' 'The Fairey Flag.' 8 more to follow...!